A marketer truly obsessed with good effective marketing shares thoughts on marketing, branding, creative, campaigns, etc. You Don't Know Me At ALL! Historical Monuments Will Be Around Forever? You Had Better Bank on it. Honestly I have to say I'm completely surprised by the Iraqi Government's ineptitude on how it handled the execution of Saddam Hussein. I mean really it's the worst PR disaster for that nation that I can think of. Government of the Republic of Iraq meet the cold hard reality of We Media. What's We Media you might ask? It's the concept that because of innovations in technology and globalization everyone can be a journalist and everyone is a consumer of everyone else's news. 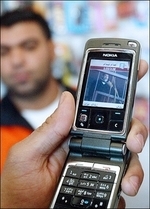 In the case of Hussein's execution a witness recorded the whole thing (embarrassing spectacle and all) on his cell phone. The technology to do this isn't as recent in itself but just think of the possibilities this guy had to spread his recent experience? He could have walked across the street to a telephone and called in his sightings to a national news outlet or verbal spoke to his audio blog right there. He could uploaded it to the news outlet's citizen journalists sites, uploaded his video to YouTube, sent his photos to Flickr, shared them with his neighbors, etc. etc. and you know what... he did them all. But that's the point! There is no multi-national news organization saying what goes on air and what doesn't anymore... they don't control the airwaves... WE do! so in a blink of an eye it's everywhere. Now what? Well that's when We Media really kicks in. I see it and show two friends, who show two friends, and so on. The we start to blog about it, talk about it, share our own thoughts and suddenly we are part of the story. We are creating the news... you, me, everyone! Think about the power behind this, no longer do you have to way for the 6pm news to hear the "late breaking but no real details report" of the natural disaster somewhere because 10 min. after it happened someone is sending thoughts, pictures, and video around the world. Amazing! Here's s the important part... there is no fighting it. The ability to put spin control on anything out there is becoming harder and harder and often backfires(just ask Microsoft). Really the only course of action the Government of Iraq had in this situation is to prevent the situation in the first place. Trying to control it will make it worse in most cases. For more info We Media a friend of mine, Chris Willis, wrote a leading paper on the subject located here.